German quartet Gun BarrelGun Barrel provides us with a hard hitting album full of hard rocking power metal. That might not be a conventional genre name, but I think it sums up very well the sound of the band. 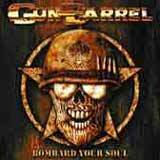 If you were to take the sounds of Motorhead, Grave Digger, and Primal Fear and mix them together, the sound of Gun Barrel would be a very reasonable outcome. For this album, vocalist Guido Feldhausen has been replaced in favor of Xaver Drexler. I would guess that even devoted fans of the band would not notice the difference between the two. Just like Swiss rockers Shakra, Gun Barrel have opted for a replacement lead vocalist that is nearly identical to the original. Despite being a solid album, Bombard Your Soul doesn’t quite match the greatness of their previous work, Battle Tested. The stand out tracks don’t stand out near as much s the ones on Battle Tested, but still, the album is consistent and it is a damn good one. Battle Tested jumped into my memory upon the first listen, but Bombard Your Soul is the type of album that takes a few listens for that to happen. Even though Piet Sielck is involved with this album, the Iron Savior-isms of Gun Barrel’s sound have lessened this time around. Still, the main ingredients of the band’s sound remain constant on this offering. Xaver’s dirty, powerful, and melodic delivery is right in line with ex lead vocalist Guido Feldhausen’s. The bass work is forceful on this album, giving each of the songs a strong sense of urgency. Each of the songs is fueled by powerful riffs and tasteful soloing. Also, the drumming is once again adventurous, sometimes using power metal double kicks, but also mixing in some beats that will sound more familiar to Scorpions or fans. Toni Pinciroli’s work behind the drum kit keeps the songs interesting from start to finish. As for the chorus lines, they are still a prominent part of the band’s sound, but they don’t immediately make you think of Iron Savior as did the chorus lines on Battle Tested. As I alluded to earlier, they won’t imbed themselves in your brain instantly; instead it will take a few listens to fully absorb the songs. Of course, don’t expect anything new or innovative with the band’s sound, but what you should expect is a thundering slab of German heavy metal with an identifiable Gun Barrel personality. Furthermore, Bombard Your Soul is very consistent album; one that you can listen to repeatedly without having to skip filler tracks. At no point does the album become repetitive or boring. There is enough variation in the songwriting to go along with the excellent individual performance of the band members to make this an excellent album. Again, the production and sound quality in general is very slick. Actually, I think this album might be a step ahead of Battle Tested simply because the bass lines are brought out more with this album. As a result, I would say that this album is the hardest hitting Gun Barrel album to date. While their third album doesn’t quite match its predecessor (not too far off the mark, however), Bombard Your Soul is another excellent offering of German heavy metal that confirms that Gun Barrel plans to stick around the metal scene for a while. The third quality of a band’s third album for me is often indicative of a band’s staying power. Some bands start off with a couple of strong albums, but then begin to fade with their third. This is not the case with Gun Barrel. While this is nothing new or original, these guys do their thing very well, and are establishing themselves as prominent players in the German heavy metal scene.